We are still having many 90+ degree days here in Phoenix, but on cloudy days we get nice 80 degree weather and no matter what it is still a nice respite from the 105+ weather this summer. 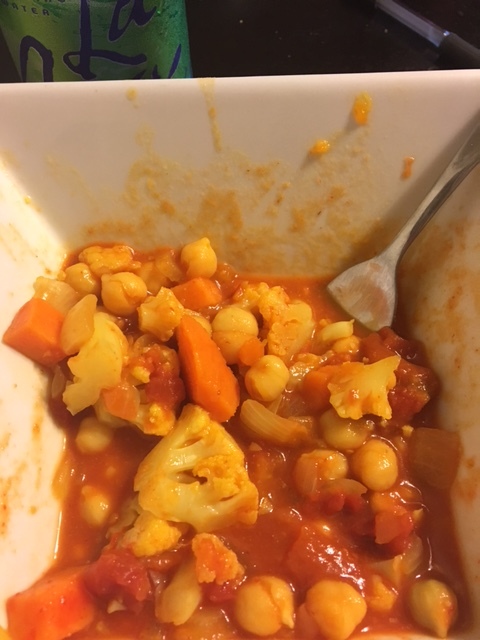 Plus, we are getting nice fall vegetables in our CSA boxes so when we were given some of the main ingredients for fall curry I knew that would land on our menu this week. Spices, new flavors, fall… there’s a lot of nice things that drew me to this recipe. We’re a big fan of Indian food because it is already designed for mostly vegetarian eating. It also brings back nice memories of the Indian restaurant my husband and I would eat at when we were in graduate school. (they had an AMAZING lunch buffet… I miss it!) So I knew this would be a nice meal to have together. 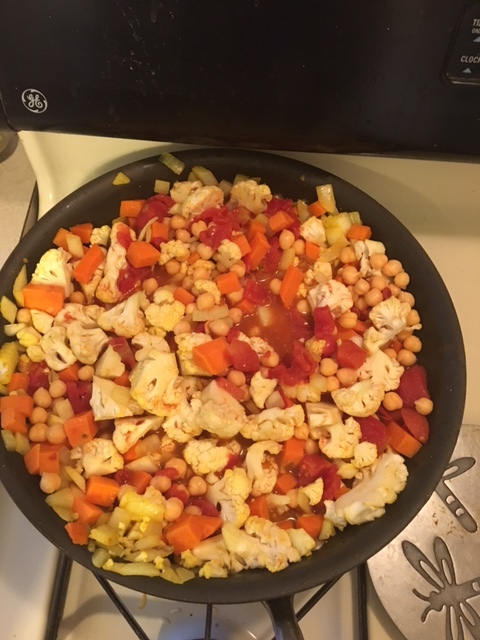 Our local grocery store was out of madras curry so we ended up using the standard yellow curry powder instead, so I’d like to try this again with the correct spice. Still, the yellow curry powder was tasty anyway.We used our biggest pan and I was a little nervous about all the ingredients fitting but I made it work! I also added a little extra vegetable stock because I like being able to sop up the liquid with naan (or homemade bread since that was what we had on hand in this case). It was so warm and yummy I forgot to take a picture of full bowls! oops! What are your favorite fall veggies/savory recipes? When I think fall I go straight to baking and desserts so it’s fun to remember the savory side of things!